My wife has discovered local swap meet web sites. This can be useful, like when she scored us a free elliptical machine, or not as useful: “Do you need 160 square feet of patio pavers? It’s only 50 bucks for the whole pile.” I admit, that would be a good deal if we had a patio, or even a potential patio area, but as it stands, we’re holding out for further price reductions. On the useful side, we bought a bunk bed frame for the kids. When we went to look at it, the nice lady selling it gave Big Brother a pair of roller blades her children had outgrown. 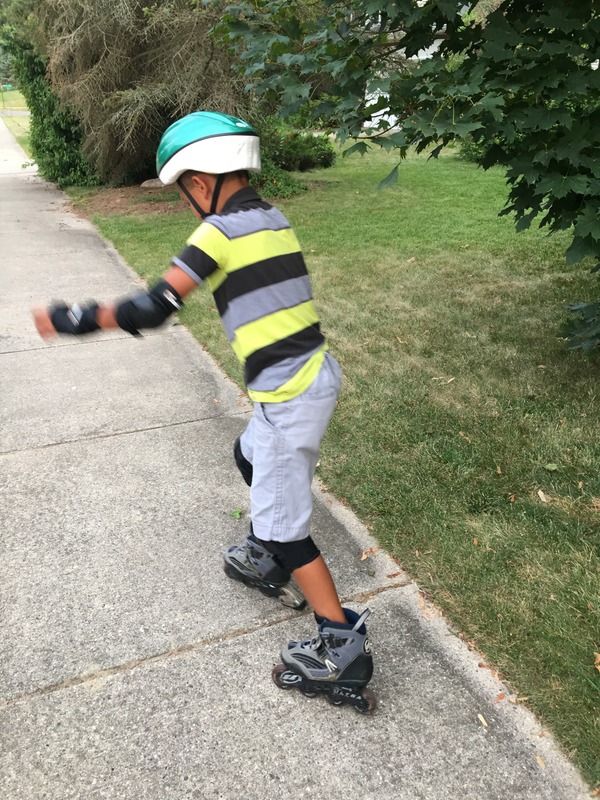 Recalling the length of time, and the voluminous gnashing of teeth, it took for this kid to learn to ride a bike, I was unsure of the usefulness of the roller blades. And how much would these free blades cost us in pad purchases? Chalk up another useful application of the Internet. Within two days, my wife had located a complete, never-been-used set of pads for $10. The only piece left to be put into place was the boy’s willingness to fall repeatedly in order to learn a skill requiring real effort. The first time he put the roller blades on his feet, he practically had to be carried out to the driveway. Up and down the sidewalk, he rolled a little, clung to me a lot, and fell down most of all. The clinging wasn’t helping him master his balance, so I cast him off. He started making two or three strides in between falls. Stride goeth before a fall. I thought these comments might intimidate him, but he seemed to like thinking of his joints as shatterproof. It encouraged him to try again. He put together a few more strides, then tumbled. The indestructible boy grinned and climbed to his feet. He took four strides before the next fall. “Your wrist would be toast right now. Completely mangled. Thank goodness for those awesome pads, right?” He was wearing his old bike helmet, so she didn’t bother to crack his skull. He went at it until dark. The next day he made it to the end of the block on one tumble. It’s been nothing like the slow agony learning to ride a bike was. It just goes to show that kids can surprise you with their drive to accomplish difficult things. It also shows how Dad can always learn from Mom. I clearly didn’t talk enough about broken bones during bicycle training. Maybe if I encase him in bubble wrap and throw books at him it will make him a more avid reader. 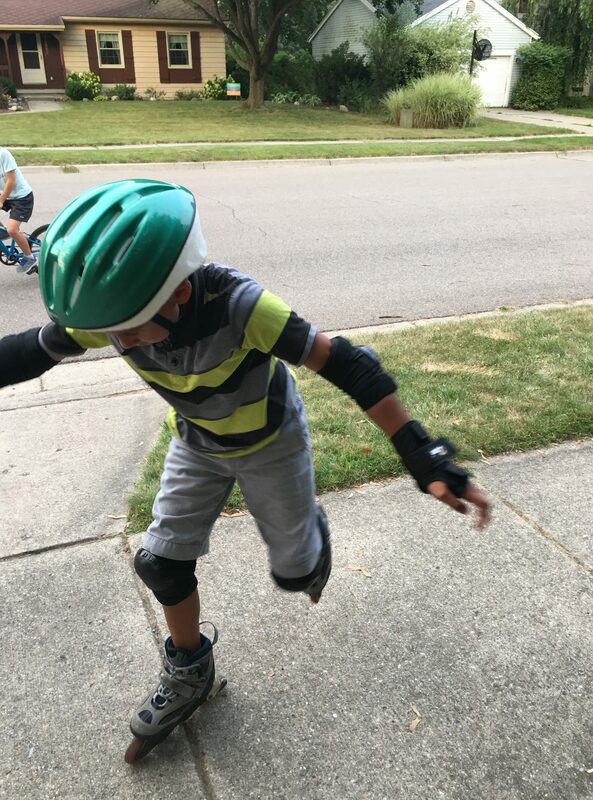 This entry was posted in Random Toy Box and tagged boys, Dads, family, fatherhood, humor, inline skates, kids, parenting, roller blades, sports. Yeah, I know it. I’m just trying to read vicariously through him since I don’t have the time anymore. The mother is responsible for most of all that. Thank you. It comes from living among funny people. I love a good bargain too! You’ve got one clever wife. I wonder what she’ll come up with when it comes time to teach them how to drive a car? She’s out eyeing all the neighbors’ cars right now. Ahaha! Preparing ahead. Smart lady.